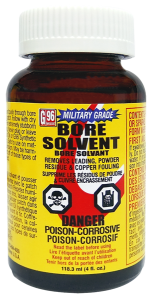 Military APPROVED Bore Solvent (Rifle Bore Cleaner RBC-372F Type A) removes Leading, powder residue, and copper fouling from bore of the firearm. Retail: Available in 4 fl. oz. and 16 fl. oz. bottles. Safe to use on metals. Will not cause rust, oxidation, staining, or galvanic corrosion. May be harmful to some paints, varnishes, and plastics. Keep product off of these types of surfaces unless a previous patch test has shown no effect. It is recommended that the firearm be re-treated with G96 Gun Treatment, G96 Gun Oil, or G96 Synthetic CLP Gun Oil after use. Saturate patch with bore solvent and push through bore from breech and out muzzle. Repeat with clean saturated patch. Follow with dry patch. Repeat wet-dry patch process until bore is clean. For stubborn deposits, leave on for up to 60 minutes before removing. Never plug or leave patch in bore. 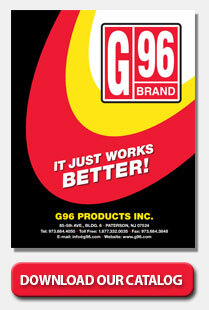 Re-treat with G96 Gun Treatment, G96 Gun Oil or G96 Synthetic CLP Gun Oil. Run a dry patch through bore before firing. Safe to use on metals. Will not cause rust, oxidation, staining or galvanic corrosion. May be harmful to some paints, varnishes, and plastics. Keep product off of these types of surface unless a previous patch test has shown no effect. For firearms use only. * Bilingual packaging is also available for Canada. Please specify when ordering.